In 2014, I started writing a blog post called “Doing Laundry With Anxiety” go figure that I never finished it. It was about how horribly difficult it was for me to do my laundry because my anxiety made it feel like an insurmountable task. It took so much force of will to make myself do it and it was draining. You could often judge my anxiety level based on the number of clothes that were unwashed. I had a few impossible tasks, laundry, checking the mail, and doing dishes. Checking the mail was especially hard. I lived in an apartment complex and had one of those mail lockers in the laundry room. I can’t tell you the number of times that my locker got so full that they stopped my mail service and I had to call and reinstate it. I’ve tried to figure out where that anxiety comes from. Am I afraid of bad news? What is it that makes me want to completely block it out and ignore it? I still have no idea. Fun fact: I own my own home now and my mailbox is literally right by the front door and I still have difficulty checking it. I walk by it multiple times a day. All I have to do is reach in there and grab it… and I don’t. This tweet went viral last year and I was like “Yassssss. This is the exact thing that I do! So many things feel like daunting tasks even though you know it will only take a few minutes. In fact, the time you take obsessing about it, planning it, thinking about it, worrying over it, beating yourself up about it- often takes more time and energy than doing the thing. I’ve ignored emails that only require a one line response. I’ve had mini-meltdowns over taking the trash to the trashcan. When you have anxiety, it often feels as if you are juggling a million things at once. When you add in just that one minor thing – it starts to topple the delicate balance so you ignore it, tiny as it is, so that you can keep everything else working. 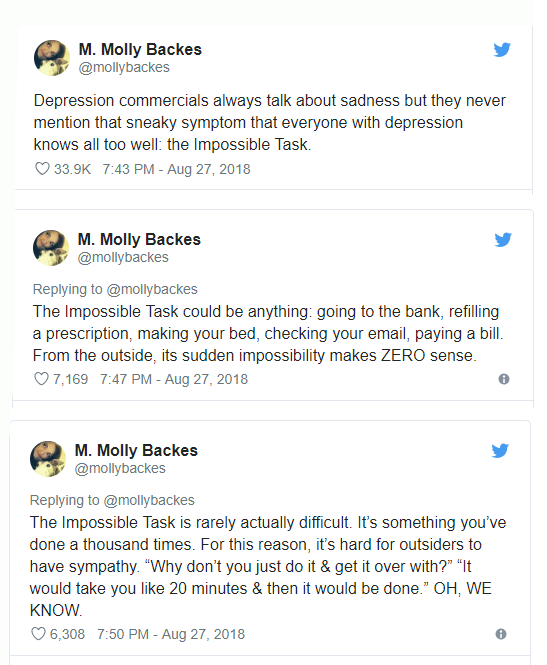 Depression adds a whole different layer to the impossible task. You’re drained, you’re struggling, and the amount of energy it takes to perform essential tasks, makes everything harder. When you’re in the depths of depression, nearly everything feels like an impossible task. I remember a day where I couldn’t get out of bed. I literally just couldn’t. I remember laying there panicking about it and then trying to distract myself by playing on my phone. Trying to forget that I couldn’t get out of bed. Eventually, I told myself “I will get up in five minutes.” and that time would pass, so I’d tell myself again – five minutes. And I think I went through that three or four times until I finally got up. I still have trouble with the Impossible Tasks. But I’ve also learned a few tips to make them less impossible. The thing about scheduling it is that you’ve got to hold yourself accountable for it (which can be difficult). I try to be one of those people that says I’m going to do something and then I do it, so this one works for me because I feel obligated to keep my word to myself. “I’m going to answer that email on Tuesday at 1pm.” and then I try not to think about it again. I’m not going to analyze it or obsess about it, I’m just going to do the damn thing. 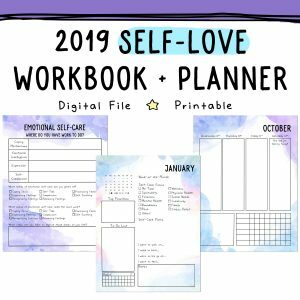 Enter my Self-Love Planner – the perfect place to keep all the things. 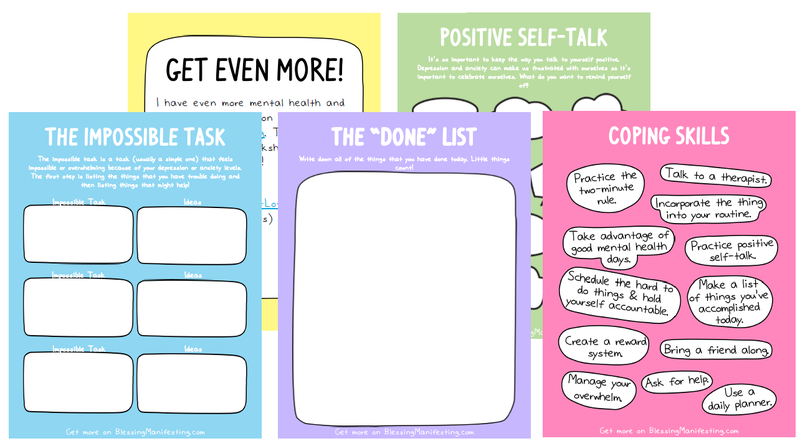 Again with that overwhelm feeling – writing out all of the things you’ve already done, even the easy things, can help you feel more accomplished and give you a little boost to getting things done. So if you got out of bed – that’s a win! Write it down and cross it off. Take advantage of good mental health days. I do a lot to manage my depression and anxiety. On the average I’d say anxiety hovers around a 2-3 and depression is 0-1. This is a huge thing for me as a decade ago I was at a 10 all day every day. There are also days when I’m at a 0-0 and feel full of bad-assery (more bad-assery than usual?) and everything just easily flows and I don’t find any resistance within myself. I feel full of get-up-and-go. I often use that energy to get the impossible things done without a blip on the radar! The only problem with this is that those energy spikes are completely random! Make it into a routine. If there’s an impossible task that you can do with some regularity – daily, weekly, monthly – purposefully carve out a space in your routine and stick it in there. It’s even better if you can add it to your routine first thing that day and right before something you want to do. That way you get it done and out of the way and then you have something good/fun/nourishing to do afterward. A little something to look forward to can go a long way. Make little goals with rewards at the end of them. Fill your prescription for 3 months straight on time? Treat yourself. Have no dishes piled up in your sink the entire week? Do something nice for yourself. Let your obstacles be steps toward getting something you really want. If you live with a spouse or family member and one of your Impossible Tasks is a chore, think about trading one of theirs for that thing you have trouble with. If it’s something like going to the laundry mat, doctor’s appointments, or grocery shopping – ask for someone to go with you. Company can make it a much less impossible thing to do. One of the things that can stop us from doing the Impossible Task is the fear of the things that task will trigger that will cause more overwhelm. For example answering that text or email is probably going to lead to a response. Doing laundry means that you have put it away. Listening to the voicemail means you have to call them back. Instead of getting overwhelmed with “If you give a mouse a cookie…” syndrome, just focus on doing that one thing at a time. Doing the dishes is so hard for me. I love all other types of cleaning. I even enjoy doing the dishes once I get into it, but sometimes it’s hard to start the process. If I’ve let my dishes pile up, I have a few different ways of tackling them. The two-minute rule is washing them for two minutes – usually when I’m microwaving something or when I go into the kitchen for a drink. Another thing that I’ll do is one type of dish at a time. Plates first and then cups later and then silverware the next day. Another trick is washing 3x what I need. If I’m making lunch and need a plate, instead of using one that’s already clean I’ll clean three plates instead. 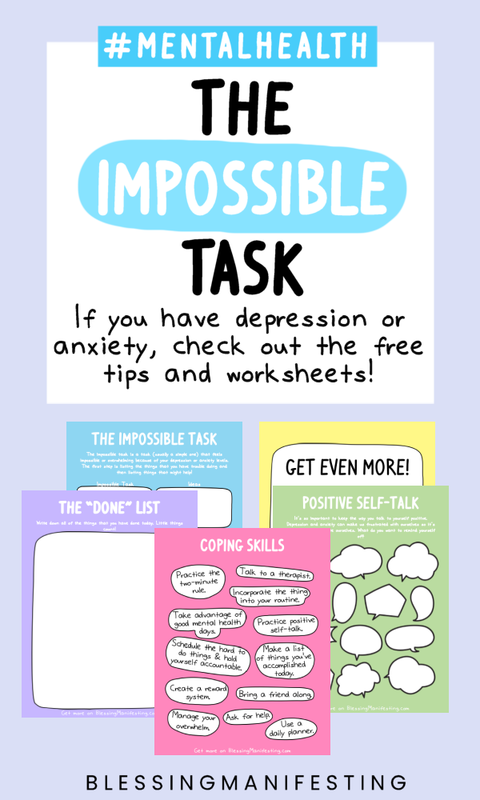 If you find yourself having a lot of impossible tasks and it’s starting to seriously affect your mental health, it’s time to do the thing and see if professional help would… you know… help. Talking with a therapist can give you a great source of accountability, strategies, and advice. Medication can also help manage those feelings. Remember whatever works for you works for you and that’s all that matters! I kind of wrote about this topic in 2017 from the perspective of when it’s hard to do things you need to be hyper-focused on how you talk to yourself. “You’re Doing SO Good.” is one of my mantras. You can get frustrated and mentally beat yourself up OR you can hype yourself up by focusing on how awesome you are. How do you encourage yourself to do the Impossible Task? 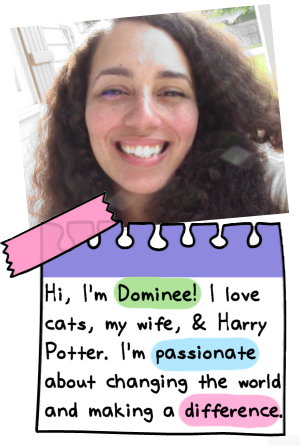 I made some Impossible Task worksheets to help motivate you to do the things! 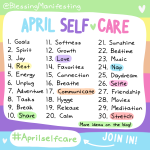 Next Post April Self-Care Challenge!